This four bedroom family home features a generously sized, fully fitted kitchen / family dining area with the added luxury of a separate living room, both feature french doors to the rear garden. A useful utility and cloakroom complete the ground floor. On the first floor you will find four double bedrooms, the master of which includes an ensuite and built in wardrobe. The remaining bedrooms are served by a contemporary, family bathroom. Externally this property offers a garage and driveway parking. 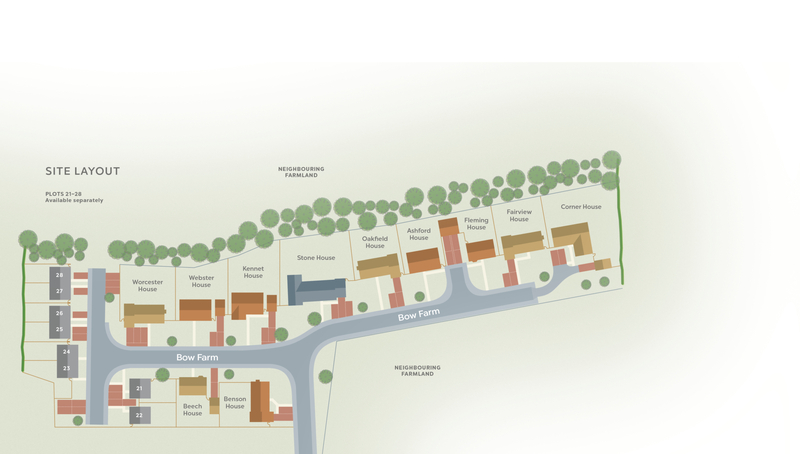 To register your interest in Ashford House, Plot 34 and/or to arrange a viewing, click the button below and fill out the form. 7005mm x 3790mm 23'0" x 12'5"
5305mm x 4655mm 17'5" x 15'3"
2955mm x 1540mm 9'8" x 5'1"
4655mm x 3500mm 15'3" x 11'6"
3405mm x 1305mm 11'2" x 4'3"
3790mm x 3300mm 12'5" x 10'10"
3405mm x 3250mm 11'2" x 10'8"
3615mm x 2985mm 11'10" x 9'10"
2735mm x 1975mm 9'0" x 6'6"
Ashford House, Plot 34 is part of the Bow Farm Phase Two development. For more information click the button below.